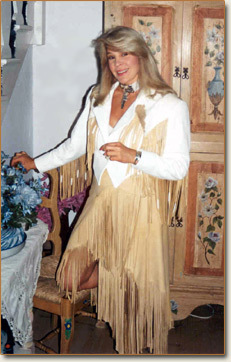 Lou Ann Kosaks' unique Western fashions offer the ultimate in elegance and beauty. For the ultimate in elegance, sensuality and femininity, choose a design from the exciting CHIC SKINS collection. Whether attending a special occasion in the city or spending an evening in Santa Fe doning flowing fringes and sterling silver conchos, designer Lou Ann Hardister's goal is to create the ultimate in elegance and beauty, reflecting her own particular "style." However when designing a custom piece Lou Ann welcomes the input from her client, creating uniqueness and individuality of its very own, surely making any woman feel like an Indian princess. Ladies, don't underestimate her abilities to build a handsome Jacket for the 'special' man in your life. CHIC SKINS has been in business since 1983 and has concentrated on designing one of a kind leather garments. Each piece of leather is individually selected for its uniqueness and suburb quality. By combining sumptuous leathers of many varieties, exquisite colors, exotic feathers , and intricate hand beading, each piece has a unique look and feel of it's own. When integrating laces into some of the evening wear and Wedding dresses, Lou Ann chooses either French lace, with beads, crystals and sequins, or it is of the collectible antique variety. Lou Ann collaborates with a select group of very talented artists who help provide the outstanding craftsmanship that CHIC SKINS is known for. Beautiful Indian motifs and desert scenes are skillfully painted by hand on Jackets, skirts and tops. Horses of all breeds, from pintos to exquisite Arabian mares and exotic stallions, can either be painted or burnt into the leather to adorn the yokes of jackets and shawls. The African Safari scenes have also been very popular this year. Lou Ann has had the pleasure and privilege to work with a number of top stars in the music business, among them are Alan Jackson and wife Denise, Emmy Lou Harris, Tanya Tucker, Billy Ray Cyrus, Kix Brooks, Stevie Nicks, Bo Derek, and Wade Hayes. Depending on the desired look, custom work can take up to several months to complete. There are many details that need to be addressed and sometimes fittings are required. Please feel free to call or e-mail Lou Ann of CHIC SKINS any time to discuss various options.